WELCOME TO OUR NEW CONTINUING SERIES GHIBLI ROCKSLOOKING AT THE WORK OF HAYAO MIYAZAKI AND STUDIO GHIBLI AS A WHOLE. NEXT IS HAYAO MIYAZAKI’S ODE TO ROMANCE, PLANES, FRIENDSHIP, ITALY AND POST-WORLD WAR I EUROPE; PORCO ROSSO RELEASED BY GKIDS/SHOUT FACTORY ON BLU-RAY. The hardest films to write about are the ones that you have a deeply personal reaction to. The Fountain is a film I wrote 2,500 words about, on this site, to try to grapple with that very fact. In the Mood for Love is another film that I constantly wrestle with putting onto page what makes the film so personal to me and why it has affected me as such. Porco Rosso is such a film. Written and directed by Hayao Miyazaki and released in 1992, Porco Rosso comes on the heels of Kiki’s Delivery Service. The film pushes Miyazaki’s fascination with flight further than and more accomplished than before. The film tells the story of a cursed ex-fighter pilot, once named Marco, now bounty hunter making his way in the world known as Porco Rosso (aka Crimson Pig). Miyazaki’s lighter than air touch is omnipresent here as the film never feels as though it has a traditional plot. If discussed in this review it would almost seem episodic, which the film is not. The film share more in common with Perfect Blue as it is a mature character study. Where Perfect Blue is a character study of a woman dressed up as a thriller, Porco Rosso is a character study of man dressed up as a rousing adventure tale. 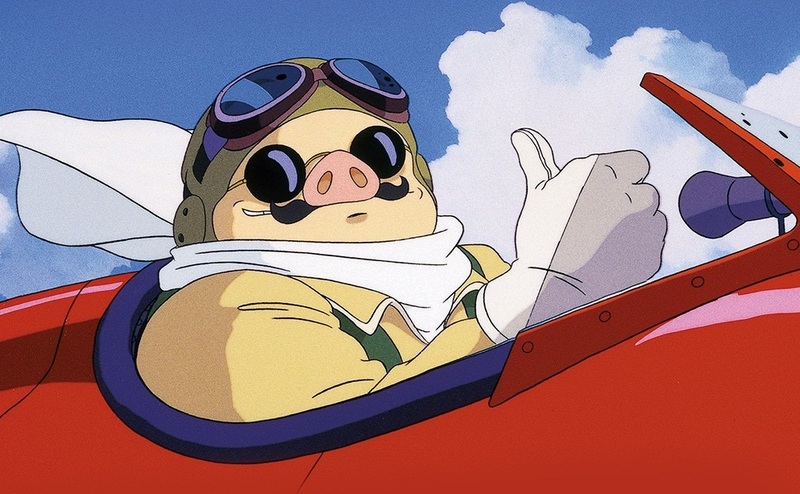 Porco is constantly ridiculed because of his looks and because of his looks his status as an ace pilot. As a man who’s dealt with being overweight for the better part of his adult life Marco/Porco’s plight rings true. Marco/Porco’s is constantly being called “Pig” and challenged. No matter how good I’ve been at something. No matter how smart I am. I am always judged by my weight and looks first. I am constantly challenged by people who think lesser of me because of my weight. It is understandable how frustrated Marco/Porco is having at every moment someone trying to prove he’s lesser because “he’s just a pig”. Miyazaki understands what constant ridicule does to someone. The small touches of Marco being insular; not interacting is all things people with self-image issues do constantly. Some people make jokes about their looks. Others shut down. Others lash out violently. In my life I’ve cycled through all of those personas. Its too mask the pain of acceptance. The old addage of when life gives you lemons make lemonade is a lie. At a certain point humans do not want to turn the other cheek. Imagine being someone just wanting to be able to go through life without being reminded of what you know. What would you do? Mayazaki understands the pain and sadness of that ridicule. It effect every piece of a person. It changes the way they interact even with the people they care for. The relationship that Madame Gina and Marco/Porco have all the more melancholy. Gina is the only one who calls Porco by his real given name Marco. There is a dance that’s played out in their relationship; both know they love each other but cannot for various reasons beyond their control, consummate their relationship. The one thing that Mayazaki makes clear it is not because Gina thinks of him as a Pig. Its actually Marco that mentions it to her during an inmate moment. Miyazaki always gives Marco/Porco dignity through every challenge and moment of the film. The director understands that Marco/Porco isn’t to be pittied but is someone that finds pride in silently proving those wrong. There are moments where Marco/Porco is self loathing to the point of hurting himself but its made clear this isn’t the way that the film feels about him. Porco Rosso’s power comes from Miyazaki’s understanding of not just Marco/Porco as a character but everyone that inhabits the story. Even the Pirates and Donald Curtis, the ace pilot the Pirates hire to take Marco/Porco down a notch. Curtis is everything that Marco/Porco isn’t; good looking, blustery, cocky, arrogant and an outright lout. Miyazaki does not make rivalry a romantic one, though many plot synopsis would tell you otherwise. Curtis never vies for Gina’s affection because she is only interested in Marco/Porco. Though Curtis through his blustering and such would make you think otherwise. Though Miyazaki imbues Curtis with the aforementioned traits, at his core Curtis (and the Pirates) are not bad people just misguided. They have no understanding beyond their own issues. Curtis wants to go to Hollywood to become a movie star. The Pirates just want to get paid and do their pirating without Marco/Porco interfering. Miyazaki understands though people are cruel and do cruel things they are doing what they know how to survive. He never blames or labels Curtis or the Pirates as villains, in as much as he never calls Marco/Porco a hero. True humanity comes from understanding all sides, though not agreeing, but building a bridge to that understanding. Part of the beauty of Porco Rosso as a film and as a character study is that ultimately the film is about being more humane to one another. Miyazaki is not a sentimentalist by any means, the film ends with Marco/Porco and Curtis first fighting in the air and eventually beating each other to a bloody pulp in the middle of the ocean. It’s through this beating and the eventual face off against the Italian Fascists that we see the men find a mutual respect for one another. Curtis looks beyond Marco/Porco’s visage and finds a man he was jealous of but respects. Marco/Porco finds the man he used to be in Curtis. It was never that Mayazaki thought either man was inherently good or bad. They were men with their own concerns and points of view. Possibly the most humbling and beautiful message is not just the acceptance of Marco by the pirates and Curtis but the romance between Marco and Gina may (or may not) have been consummated. At the end the film does not postulate that you do not need to turn into a beautiful empty vessel to be accepted and loved. Unlike so many romances of these sorts that at their end wants not just the happy but the pretty. Miyazaki a true humanist knows that this doesn’t have to be the case. You can be a flying Pig and still get your happy ending. For any film (animated or live action) that is a beautiful rare sentiment, rarer still in an adventure film. Porco Rosso isn’t just a brilliant animated film or a brilliant adventure film… it’s just a brilliant Film. Period. End of discussion. GKids/Shout Factory has received a brand new remaster from Studio Ghibli for their Blu-Ray release of Porco Rosso. The original transfers for Bu-Ray and DVD were decent, but early in Blu-Ray’s life. This newer transfer looks stunning. The film’s flight scenes look amazing, razor sharp. The animation lines, colors everything looks cleaner without a hint of artifacting which can definitely be a problem with animation. Bravo to GKids for the care and time that went into this transfer. Any would be action/adventure director would do good by watching this feature and seeing how Miyazaki constructs action. Fledging animators should also take note that the entirety of the film has been presented in Story Board format. Further making this special, these are Miyazaki’s own hand drawn storyboards. It’s a fascinating watch toggling back and forth between the completed film and story boards. The Behind the Microphone featurette is merely an EPK style behind the scenes with the actors briefly discussing the film and their character. The interview with Toshio Suzuki the films producer is a great discussion of the making and the release of Porco Rosso. With no real insightful behind the scenes documentary this is the best substitute. The Trailers and TV Spots do hold some interest as they include some of the Japanese advertising. I mention the booklet as it’s an by Miyazaki himself to give insight to the making of this film. Porco Rosso is filmmaking at its finest. Few films can rival the beauty, entertainment and sheer filmmaking power that the Crimson Pig can muster. Highest possible recommendations.